Good News Everybody. The typewriter (actually the raspberry pi) is now capable of picking up print jobs from my typewriter API. See yourself in the following video. For now I just use a web interface to add the jobs manually but soon the jobs will come in from twitter via a hashtag or tweets towards the typewriter. It’s a Ruby on Rails App hosted on Heroku with a password protected API to make sure only the typewriter himself picks up the new jobs. Also as soon as the typewriter picks up a new job, its status changes. So based on that I can let people know when their job started / is done. More Good News. All keys are connected now (no numbers though) and are WORKING!! Just not at the same time yet. Reason for that is that I have been trying to solder up a better control board and failed again on the design. Why I wanted to have a soldered up control board was to make it easily and quickly replaceable (modules). So a 16 pin cable would come from the raspberry pi and plug into the control board while a 32 pin cable feeds the solenoids while another one feeds the new line motor and another one the page return. Besides being able to replace things easy, I thought it would cause less issues if the table is moved since everything is soldered up and no pins can move (compared to a breadboard setup). That said, I will just use breadboard for now, since I lost too many parts already in soldering up control boards. I guess I am bad at that. I changed the ribbon, got it at Stables, no problem. Had to roll it over to the typewriters wheels by hand though. What I hear from people that worked with typewriter before (back in the days) I can roll this ribbon back and forth a few times before it will run out. Not just once. That’s good. Although I thought I would use a webcam (USB to raspberry pi) to make things easier (compared to a network camera because of being able to time things from the raspberry pi rather than the web app), I just had the idea to use an HTC smart phone I have sitting around (it’s actually a good phone, I use it whenever I am back in Europe). Sure enough, there are many apps around to turn that, just via WiFi, no SIM card needed, into a good network based camera. So 20 min after the idea, I got it working via “IP Webcam” and now have a stream that is good enough to go on the website to show people their tweets coming out of the typewriter. Paper Size, I do like using the small cashiers rolls, since they do not need a lot of cartridge movement to set it back to the start. For tweets that is okay, since I fit about 25 characters on it anyway. If we want to get more serious, there is bigger rolls (for fax machines I have seen so far) but don’t want to worry about it too much right now. Hiding or Showing? There is now a lot of electronics involved. What is nicer, not to see any of them or show them all right away? 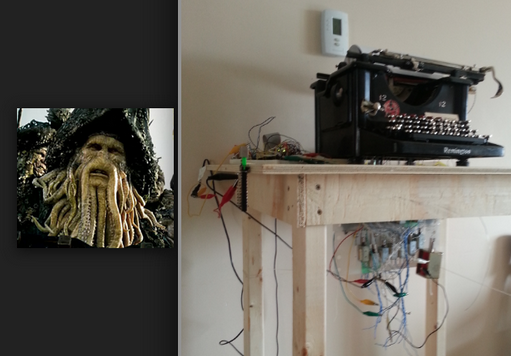 Right now the typewriter table scares me. As always, if you have any ideas how to make this project better or have any questions, feel free to comment here or contact me directly.